This contract sets the terms for the design of a logo, print material, webpage or other graphics. It is suitable for work where the client is in the UK and the designer is abroad. It includes provisions to transfer the rights in the intellectual property of the design to the client once the work has been completed. 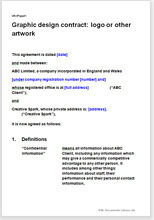 This is a straight forward contract for the production of any artwork. We assume that it is the client who will use it, and therefore have included terms that give him or her legal advantage. However, it could be edited by a designer to provide a more neutral contract that a client will be happy to accept. The main strength of this agreement for the client is control over the ownership of the intellectual property in the artwork. It provides for a transfer on completion to the client of all created work. The subject of the agreement could be any artwork, whether a logo, an illustration or enhanced photograph, print material such as a brochure, graphics for an app, or a webpage mockup or final design. We keep the legal content separate from a specification of work, which you should set out in detail in a schedule. That allows the contract to be reused with minimal re-editing. The designer could be self-employed or working through a company. He or she may work on or off your premises and may use staff besides him or herself. The document can be used if the designer is not based in the UK. We offer other agreements related to website design but no other covering exclusively graphic or artwork design. A much longer contract for a large project is one for design of a website. This is easily adaptable for work on a game or an app. There are also over 1,400 words of helpful drafting notes that explain how to edit the document to suit your requirements.